CUP is very nice indeed... a big, light and airy storefront cafe on Thomas Street with previous occupants Vox Pop records crammed into the back. The place reminded me a bit of the much-missed Suburb, but quirkier. Cup's menu had a small but fairly nice selection of soups and sarnies - I had scrambled eggs and fake bacon on a bagel, which hit the spot. And they sell Tunnock's teacakes there, so I was happy. Forgot to ask if they have wireless though. Interestingly, right next door is the newest incarnation of Love Saves the Day, competing for your Latte alliegance. You'll remember the original one in Tib Street became the massive one on Oldham Street which then closed. 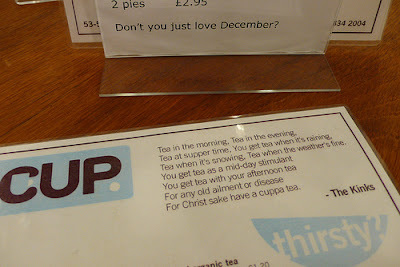 And what makes it interesting is that, for a while, LSTD was running a cafe concession in Vox Pop, which is now CUP. Whatever. It's the same lovely people serving the same lovely drinks and snacks in a joint that's considerably more stripped-down and cosy than their last digs on Oldham Street. And unlike the one on Deansgate, you can actually sit down in there without worrying about barking your shins on a rip-roaringly expensive vat of single estate olive oil. And along with Odd and Trof there are now four or five places to caff up on Thomas Street that weren't there a year or two ago. Good stuff. I'm writing now, in Cup. So yes, they do have wifi. And also...cups. Awesome. Is it free wifi, we hope? Yes, someone has now confirmed it is free. thank the Lord for independently owned coffee shops! I spend half my working day in them and cry when handing more dollar to a global corporation. I think you're mental recommending Cup like that. The few times I've been in i've found it impossible to get served, even when stood directly infront of the staff (I assume ADD is to blame) and then difficult to get a seat in one of the oh, 10 places to sit down. The tea is nice, but the food is woefully over priced (£6 for a pie and then 50p for mash and 50p for gravy is bordering on incredulous). Personally i wish cup and lstd had been put the other way round - this is one for scenesters only and it'll die the second it stops being cool. well tch... I agree they need more seating, as I mentioned in the post. Charging you for gravy does seem hilariously mean, and I imagine like a lot of new places they need to get their staff sorted (whereas the staff at the new lstd are all old hands.) But I think you misunderstood. I wasn't recommending one over t'other, just letting folks know about two more cafes in the hood. Rayner: Manchester restaurants "not quite"